Below, we will be taking a deep dive into some of the best Pellet Grills on the market. 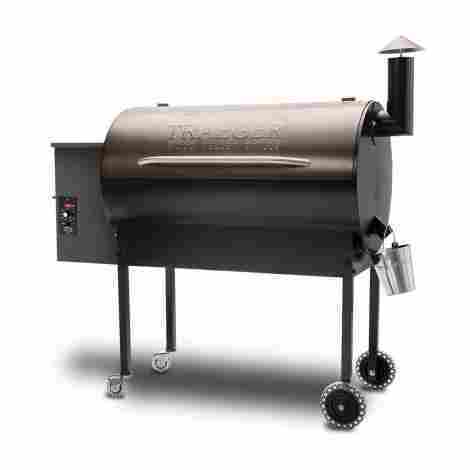 Featuring high on the list are several models by Traeger, the first company to pioneer this style of cooking. As we will see, however, many different manufacturers have stepped in over the years to put their own grace notes on this versatile cooking system. Traeger truly is the last word in Pellet Grills. The company invented them and, for many years, held the sole patent on the product. The Texas Elite is their flagship model: Durable, versatile, and user-friendly. The grill is ideal for cold weather conditions, as the self-feeding fuel pellets won't go out due to inclement weather or wind. 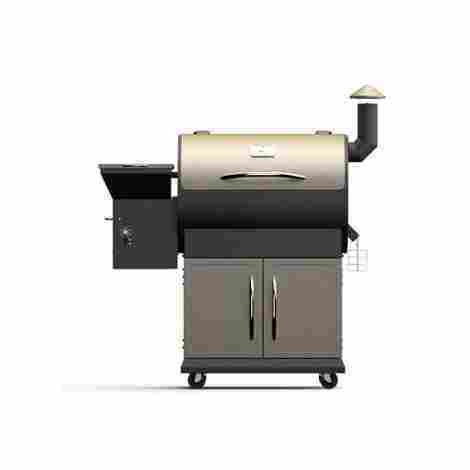 Despite its relatively small size, at least in comparison to other Pellet Grills, the Texas Elite boasts a solid 400+ square inches of cooking space, making it possible to cook for a large group at once. Furthermore, the non-stick cooking grating makes clean-up a cinch. Users love the solid construction of this grill, which insulates meat even in the coldest conditions. Sub-zero temperatures needn't keep you from enjoying the wood-smoked flavor that the Texas Elite will lend to any kind of meat. The brand name alone adds dollars to the price tag of this grill. On the whole, it's a mid-range model, perfect for someone serious about their grilling, but a bit of an investment for the occasional user. The inherent quality of Traeger's product line more than makes up for the price, however. If small and portable is what you're after, look no further. At less than 60 pounds, this is one of the more lightweight Pellet Grills on the list. Perfect for camping or tailgating, the Davy Crockett is also wifi enabled so you can monitor temperature and cooking time anytime, anywhere. An ideal grill for small groups. This one is so lightweight, it doesn't even need wheels. The Davy Crockett is built with foldable legs that double as handles, so you don't even need to take the time to tediously take the grill apart and put it back together every time you want to transport it. The Davy Crockett has some of the most high-tech temperature controls available. With wifi enabled features, users can control temperature and be cooking tie from Green Mountain Grills' phone app. Another feature that makes this ideal for tailgating. With the decreased size and cooking space comes greater savings. This Grill is reasonably affordable for what it is. That said, given the automated temperature control and regulated fuel supply of the grill, one can expect to pay a bit more than a standard charcoal-fueled model. Traeger stands by their products and this one is no different. Warranties on Traeger grills are typically three years, a whole year longer than many other companies allow. This speaks to the company's faith in their grills. So owners can rest easy knowing that any issues will be taken care of promptly and on the company's dime. This grill is built for the tailgate. The collapsible legs make moving this grill quick and painless. Furthermore, the rear set of wheels makes moving the fully unloaded grill simple as well. Perfect for a small family or a group of friends getting ready for the big game! 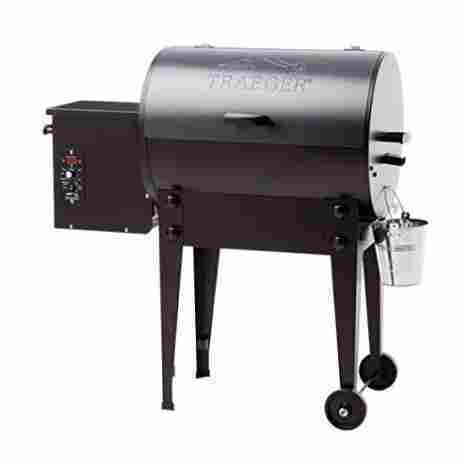 Once more, this is a Traeger grill, which comes with a Traeger price tag. A bit more than your typical Pellet Grill, especially one this small. That said the extended warranty alone is an added bonus when buying Traeger, along with the quality craftsmanship of the product. The separate searing station is a serious upgrade. 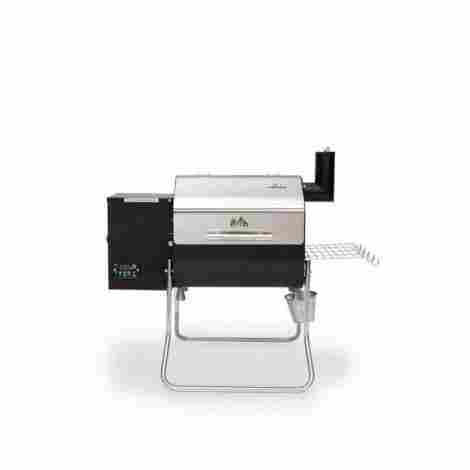 Separately powered by propane, the sear box allows for temperatures that no other grill on this list can touch. Perfectly sear steaks or flash-cook any number of meats for a completely different cooking experience. With other grills, it's necessary to bust out a vacuum cleaner to properly clear out the ash sediment that can build up over time from burning wood pellets. Not so here. The Woodwind is built with a specially designed lever-operated chute that quickly and efficiently removes the ash from each use. This one is a Cadillac. The price point is hefty with the Woodwind, and users should expect to be using it on a regular basis to get their money's worth. The Sear Box alone is like having a separate gas grill along with your pellet grill, a factor that helps to justify the price. The Smokepro DLX really excels when it comes to maintaining a steady internal temperature. The LED display is large and easy to read, while the included probe maintains an accurate measurement of what's going on in the smoker. This is truly a foolproof system. Unlike other models, the Smokepro has an extra removable grading which allows for another level of cooking space. This effectively doubles the amount of food you can prepare, making it a worthwhile upgrade for those looking to cook for a larger audience. This model is a bit more affordable than comparable big-name Pellet grills on the market. Despite this, many of the Camp Chef innovations on the product -- Such as that convenient ash chute -- really make it a strong buy for the casual user. The Z Grill is sturdy, with a body made of heavy-gauge steel. The lid, in particular, is of solid construction, where many other products feature a cover that is made of flimsier stuff. 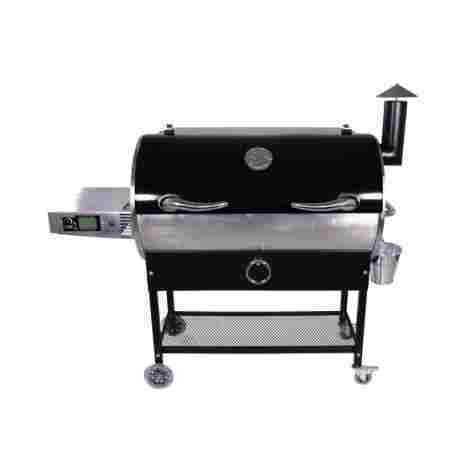 This is an ideal grill for cooking and smoking large amounts of meat. Not only does the Z Grill have a large cooking space, it also has a large capacity for pellets. The 20-pound pellet hopper ensures that cooking over a long period of time isn't a problem. You can set it and forget it all day long. Z Grills' are manufactured in China, which can be a downside for many users. 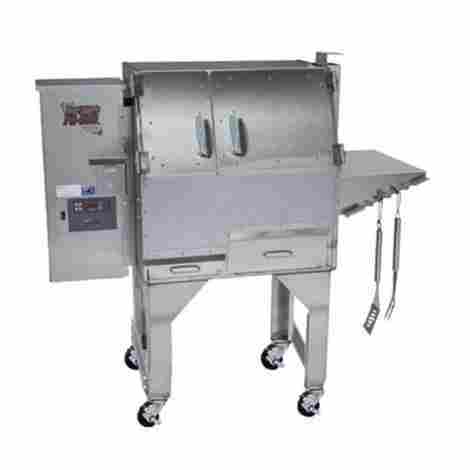 The upside is lower assembly costs which translate into a more affordable price point when compared to USA-made grills. The end result is a lot of grill for not a lot of money. The Camp Chef Deluxe excels at maintaining a consistent temperature. The system is entirely digital, with a built-in probe to measure the internal temperature of the grill at all times. Wood Pellets are fed in just enough to ensure a set temperature is held. no more wild fluctuation in heat! Camp Chef has a patented ash removal system featured on all of its grills. This consists of an easy to remove ash box that can be taken out and emptied when needed. No more taking the grill apart to vacuum out wood ash, which is as time-consuming as it is tedious. As with other Camp Chef products, the price is right on this one. Though they do not offer the same quality warranty of Traeger, Camp Chef has the same level of craftsmanship without the price point of more well-known companies. 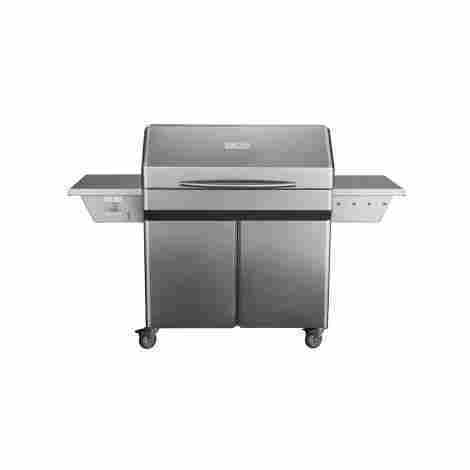 Pound for pound, this is the largest grill on the list and the only one with a commercial-grade capacity. Space itself is well over 800 square inches and can cook continuously for more than 2-days straight. This makes it perfect for a user who cooks professionally or regularly prepares meals for large groups. The cost and size of this unit make it a hard sell for domestic use. Unless you regularly entertain large groups of people, the cost of shipping and maintaining this mammoth unit just doesn't make sense. For those that smoke commercially, however, this is a great investment. Incredibly large and heavy. Not portable in the least. When purchasing the Grill Bull, expect a lot more than just a pellet grill. Rec Tec also ships you enough specially formulated fuel for several involved smoking sessions along with a customized grill cover. Both are items that most companies force you to buy separately. This grill doesn't skimp on extra space. A foldable front shelf allows users a handy prep station for readying sides, preparing meat, or inspecting the fruits of their labors. Meanwhile, the lid stays down and the smoking process continues uninterrupted. This one is an investment. One should plan on using it quite frequently to get their money's worth. That said, repeated use is easy to do when the unit comes with the fuel needed to use it as well as a whopping 6-year warranty in case anything goes wrong. The Fast Eddy is made entirely from 100% stainless steel. In addition to the aesthetics of that gleaming chrome finish, this makes it far easier to clean. Other grills are painted or feature a textured finish that makes it extraordinarily difficult to remove grease after repeated use. This one cleans up like a dream. This is another massive pellet grill that can more than accommodate a large group of hungry people. Between the stainless steel cooking grate, warming rack, and indirect cooking grate the Fast Eddy has nearly 800 square inches of cooking space. As with any other American-made product, the Fast Eddy costs more than other models constructed with cheap foreign labor. The trade-off is quality standards and craftsmanship. Additionally, users have the pride of supporting American industry. As we have seen, once you have decided to invest in a pellet grill, there are an incredible variety of options in terms of styles and features. What they all have in common is the smoky flavor of a real wood-burning grill with the convenience of a high-tech oven. Without further wait, let’s talk about the first criteria of our guidelines in choosing the ideal grills for you! 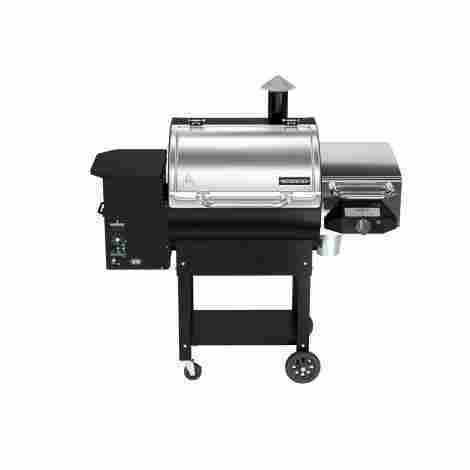 Other small design elements include locking leg mechanisms, a side tray for easy placement of cooked items and of course, the pure hardwood pellets and the grill grates. 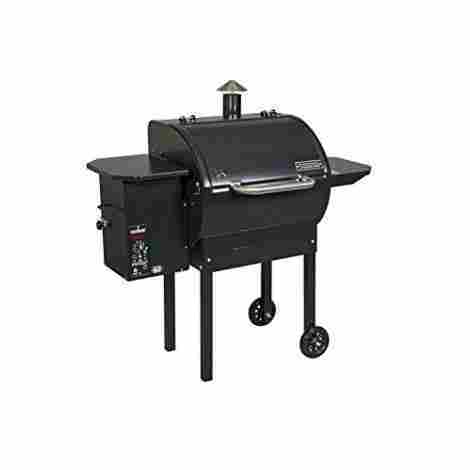 Whether you opt in for the small and portable Green Mountain Grill or the large family and even Traeger Texas Elite grill, we can say there is a large variety to choose from and we sure hope that our audience has found the best one. Now, if you have any further questions, here is an opportunity to get them answered. We want to share the frequently asked questions that individuals want to know when it comes to a quality pellet grill. Q: What is the lid made out of? Q: Does it come with a cover? Huffington Post: Do Pellet Grills Make Barbecuing Too Easy?